Committed to implementing change and positive outcomes, BWUFA has prided itself as pillars of the community. The ladies (and gentlemen) of BWUFA have dedicated their time and resources to educating people in the community, but also educating the leaders about the community. 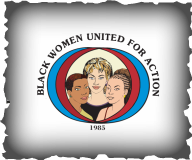 Over the years BWUFA has built and maintained strong connections with influential leaders, organizations, and corporations in order to orchestrate beneficial relationships for diversification and intersectionality. Representatives from Black Women United for Action attended the United State of Women - The White House Summit, at the invitation of the White House Office of Public Engagement. This event, held on June 14th in Washington, DC, brought together thousands to celebrate the achievements of woman and address important issues that affect the lives and livelihoods of women. Distinguished speakers included President Barack Obama, Vice President Joseph Biden, First Lady Michelle Obama, Oprah Winfrey, Wayne Buffett, Congresswoman Nancy Pelosi, Billy Jean King, Shonda Rhimes, AARP CEO Jo-Ann Jenkins, Planned Parenthood President Cecile Richards, and many more.